A top student in biology, having earned a full scholarship to attend college, and graduating in the top five percent of College of Arts and Sciences graduates, Dannette Williams cites the quality of instruction at IU Northwest as key to her success. Most of Williams’ instructors have Ph.D. degrees. In fact, all students at IU Northwest learn directly from the leading experts in their field. According to University Institutional Research and Reporting at IU, 73 percent of full-time tenured and tenure-track faculty having achieved the highest degree attainable in their respective disciplines, and 68 percent of the full-time faculty are tenured or on a tenure track. These statistics result in a direct pay-off for students. As Associate Professor of Biology Spencer Cortwright pointed out, “every one of our biology students who applied to medical school this past academic year was accepted.” In comparison, the national acceptance rate is 41 percent, according to the Association of American Medical Colleges. Because there are only 30 veterinary schools in the country, getting in is highly competitive. Michael LaPointe, Ph.D., IU Northwest’s pre-health professions advisor, says that it is perhaps more difficult to get into veterinary school than into medical school. As a child, Indiana University Northwest alumna Dannette Williams wanted to be an artist. She would spend time in the woods drawing the animals. As she grew older, she discovered science and medicine and read books about fascinating things like the plague and yellow fever. When it came time for the Portage woman, now 24, to choose a career path, she simply merged all those interests and a future veterinarian was born. 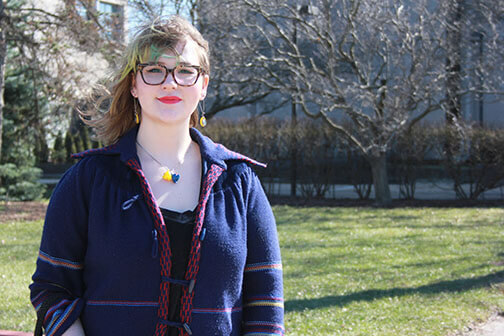 With rimmed glasses that match her green-tipped hair, red lipstick, and yellow and gold canine necklace, it is clear she has not lost her artistic flair, but hitting the books as she embarks on veterinary school this August is her primary focus now. The 2016 alumna decided to attend IU Northwest for her undergraduate biology degree, even though her sights were always set on heading to Purdue University afterwards. Since Purdue is the only veterinary school in the state, Williams says many who want to pursue this path tend to gravitate toward Purdue for their undergraduate degree as well. But not Williams. She did careful research before choosing a school for her undergraduate education and decided that IU Northwest was the best choice to prepare her for the rigors of graduate school. One reason was the wealth of hands-on experience she knew IU Northwest would provide. Intrigued by ecology and conservation, she was especially excited about working with Spencer Cortwright, Ph.D., associate professor of biology, on conducting controlled burns of the Little Calumet River Prairie and Wetlands Nature Preserve, located immediately north of campus. This was just one of the many experiential opportunities that shaped her undergraduate experience. Williams took a gap year in order to gain the required experience in the field. She worked at an emergency veterinary clinic where she saw the worst veterinary medicine has to offer, along with the best. She also worked at a zoo and a wildlife rehabilitation center. With her path now clear, Williams hopes to earn both a doctor of veterinary medicine (DVM) and master’s in public health (MPH) degree so that she can also conduct research in conservation or zoonotic diseases.